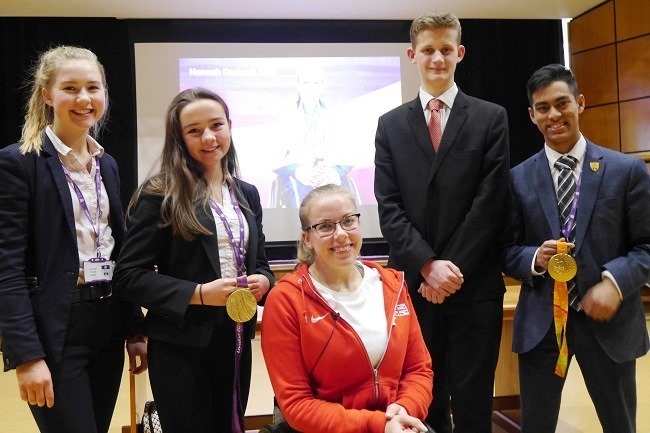 Paralympian and world record holder Hannah Cockcroft MBE gave an insight into the ups and downs of her sporting life on a visit to sixth form students at The Grammar School at Leeds (GSAL). On the upside, Hannah has enjoyed phenomenal success as a wheelchair racer, winning multiple World Championship and Paralympic titles, but on the downside the pressure and public profile this brings can take its toll as well. Build your team, not everyone will be your best friend – Hannah paid tribute to her family, the coaches and many others who have helped her along the way; while athletics is an individual sport she acknowledges that you cannot succeed alone. The talk was part of ‘Aspire’ at GSAL, a programme designed to enhance the sixth form experience beyond the curriculum, by offering students the chance to develop new skills and interests through taught courses and volunteering, as well as a series of lectures from inspirational speakers.